I had been going back and forth with WASD’s support over the firmware issues. They assured me they would get it right and offered to cover the shipping to make it work. In the end, I preferred the overall size and enjoy using a back lit keyboard. I decided to return all of the keyboards I purchased to Amazon and placed an order directly with WASD. It was a long 3 weeks or so back in the non-mechanical keyboard world, but I survived and I am now typing this update on the Code V3. It is a great form factor and support on this level is rare. I definitely recommend giving them a try. Also of interest, I decided to go with the Cherry MX Brown switches. I am still not 100% sure on this. I miss the clickiness of the MX Blue’s, but quieter MX Browns are a bit better for early mornings when the rest of the family is sleeping. I enjoyed using both the Das Keyboard and WASD Code V3. The smaller size and backlighting would have been enough to push the WASD ahead, but the roll out and Windows requirement of the V3 was too much to overlook. In the end, I kept the Das Keyboard and returned the other two. Sadly, there are not many “real” Mac choices for mechanical keyboards. Apple.com lists none. Most of what comes up on Amazon are ‘retro’ which is not the same a mechanical. Apple makes lion share of profits in the hardware space, but the number of units is still quite small. I have been using a Logitech Bluetooth Easy-Switch (K811) for about four years now. In general, it has served me pretty well. Before that, I believe I was using an Apple Magic keyboard or similar. I honestly never gave much thought to it, but in general, I liked them to be small and out of the way. With all the talk about how bad the keyboards are in the current line of MBPs, it got me thinking and researching keyboards more. The battery is the Logitech is starting to go, so it feels like a good time to take a step forward in quality. Before you make a similar change be aware, once you type of something with real quality, going back to just your MacBooks’ keyboard is very disappointing. First class Mac support. By this I mean, all the features of the keyboard need to work. No keyboard remapping, third-party drivers, etc. Standard Mac keys (command, option, function keys). A clean sound - I enjoy the rhythmic sound of the keyboard. I have used Ommwriter in the past which mimics the classic old school typing. Backlighting - I am a big fan of working in dim light. In most cases, the monitor will provide enough light, but I have never been disappointed in having the keyboard backlit. That’s it. Pretty simple requirements. The Das Keyboard was the first one I ordered. When it arrived, I was shocked at how much larger (with width and height) it was than my current keyboard. I originally was going to go with the Das, but considering how different it was, I thought it would be a good idea to see what else was available before committing. It is well built. You can pick it up, and it has a good weight to it. I love the media controls. Something about having a nob for the volume feels right. It has a low profile. It sat much higher than the Logitech but compared to the alternatives it is about a 1/4 shorter (about 1/2 inch from desktop to the top of the space bar). Keypad - I do not need this option, and with it, my trackpad ends up being slightly further away from me. USB 3 - I misread the description and thought it was USB C. While the cord is excellent quality, it is permanently attached and cannot be removed. 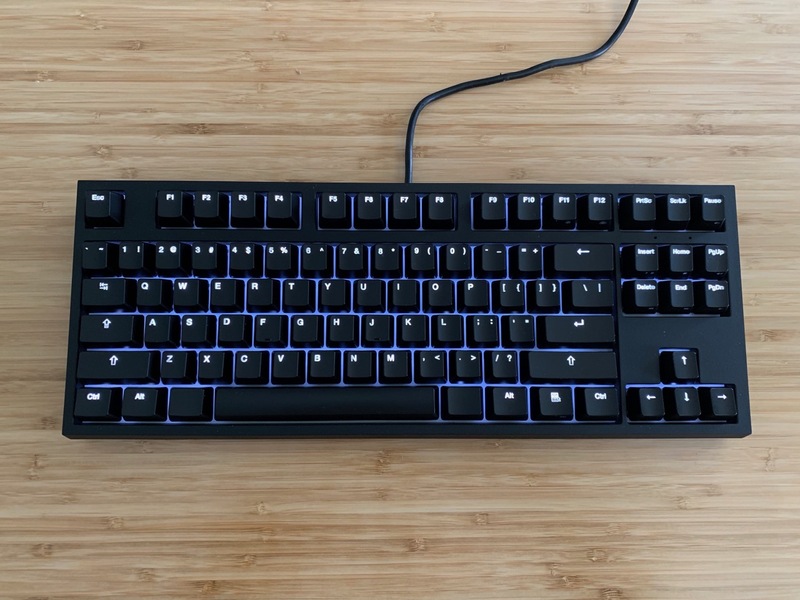 While the idea of spending extra money on a UBC C to USB C cord on a $100 keyboard is less than appealing, it is still an option on the others. Again, Mac and USB-C are small markets, but it does feel like an oversight on a Mac ‘Pro’ keyboard not to have a USB C option. 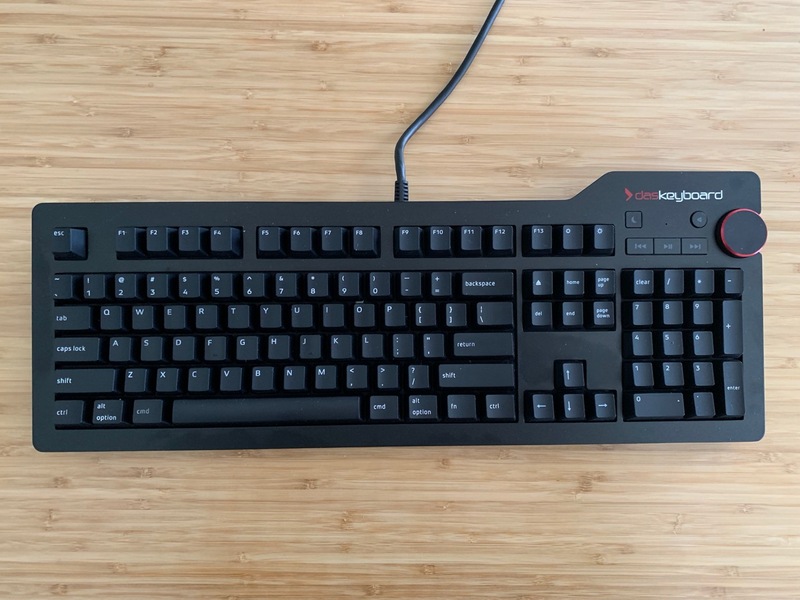 Matias recently shipped a “mini” version of their Tactile keyboard. I fully expected this would address my issues with the Das Keyboard and had high hopes. It has a minimal horizontal footprint. It is 100% Mac. All the keys are there. They work as expected. No additional software is necessary. Two USB ports. I do not have much use for them, but always nice to have the option. Well, that is it. It not a bad keyboard, but it is not for me. I know it is supposed to mimic the Apple keyboards of the past, but I am not buying it. It very tall (3/4 of an inch in the font). The space bar is about an inch at the top. With the legs up, the function keys are nearly 2 inches off the desk (keyboard a little over 1.5 inches). Without legs, the top of the function keys is about 1 1/4 inches. The keyboard feels crowded. If you look at the pictures, you can see the arrow keys in particular on the bottom right are just jammed in there. I am sure they had their reasons, but moving the function key next to the control and pushing the arrows a half an inch to the right might give it a better flow. The WASD keyboard nails this. The cord that ships with it forces the cable to the left. It is a mini USB cable (excellent quality), but it is a very odd design choice. Also with everything else white, I am not sure why this is a silver wire. Clickiness/Keys - The switches are ALPS. As I mentioned in the intro, I do not have a strong opinion here, but it sounds much more like I am slamming my keys vs. typing quickly. I have been getting the WASD newsletter for a couple of years. It was their announcement about V3 which peaked my attention. From afar, the WASD checked all the boxes. It has most of the best parts of Das Keyboard and Matias. It is narrow like the Matias, but not as smooshed. Like the Das, it has a good solid feel for the weight (it weighs more than the full-size das). It also has a critical (for me) feature that both of the others are missing, a backlight keyboard. I also love that it ships with a handy tool for removing the keys and it is infinitely customizable. I am going to complain below about the lack of Mac key options by default, but the opportunity to quickly change things is a decent compromise. It is still quite a tall (3/4 inch). Typing on a small (short) keyboard for the last decade has spoiled me (or at least trained me to think it is too high). I purchased a wrist rest which seems to help, but I am not sold on having one on my desk all the time. The V3 is labeled as USB-C. To me, this means the end of the cable that plugs into the computer is USB-C. But no, it is the end that goes into the keyboard. I can not for the life of me understand why this would ever matter. While I have a small connector to make it work, I will have to buy a USB-C to USB-C cable if I stick with this one. At the price of this keyboard, that feels like a crime. Speaking of firmware, when in OS X mode, the backtick and tilde output § and ± instead of ` and ~. I am assured there will be an update shortly, this feels like a big early miss. The Code keyboard has a great five-way configuration option for the cable. This is great because you can optimize the cable for where ever you will need to plug it in. Unfortunately, the cable they send you is about a millimeter or so too thick. It ends up ‘scratching’ the cable in all the places that it gets tucked in. Since I would likely swap it out, it isn’t the end of the world, but it is still a bummer. No USB ports - I do not have anything to plug in, and my desk has built-in charging ports, but you never know. It is not ‘real’ a Mac keyboard. You can Mac enable it, but the keys are not all labeled. They sell a pack of keys to address some of this, but again, another $20. The other two keyboards I am comparing it to are Mac keyboards through and through. I love those media controls on the Das Keyboard. After some back and forth with the WASD support team, I have been informed the firmware updates to both fix the backtick and tilde issue as well as enable the V3 specific features would not only require a firmware update, but that update would need to be done with a Windows computer. Why was the V3 shipped without support for the V3 specific features? I understand there may be bugs jumping in a new product early, but wholesale not there is an awful experience. Needing a windows computer to perform the updates. You can not list Mac compatibility and then say I need Windows to use it. Andrey Butov recommended, despite its looks, to check out the Corsair. I made my once a year trip down to the local Best Buy to give a look and see if there was anything else to check out. In typical Best Buy fashion, most of what they had on display, was not in stock, but there were a couple of Corsairs on display. I am in favor of backlighting, but I don’t think a rainbow is what I am after. It also looks like they rely on quite a bit of software to be fully functional. None of this software appears to be Mac capable. There are some workarounds (like making settings a windows machine, the keyboards of memory built in) or using a community set of drivers, which is not something I want to rely on. While there, I did see a couple Logitech mechanical keyboards. I liked they had a nice and simple white backlighting, but the one they had on display just felt cheap (and it wasn’t any less expensive than anything else I had looked at). Donn Felker recommended the Kinesis Advantage 2 which mixes in some very interesting ergonomics, but at this point learning a new keyboard layout (and doubling the price) is not something I willing to do (and really, damn increasing the price and not Mac-specific). 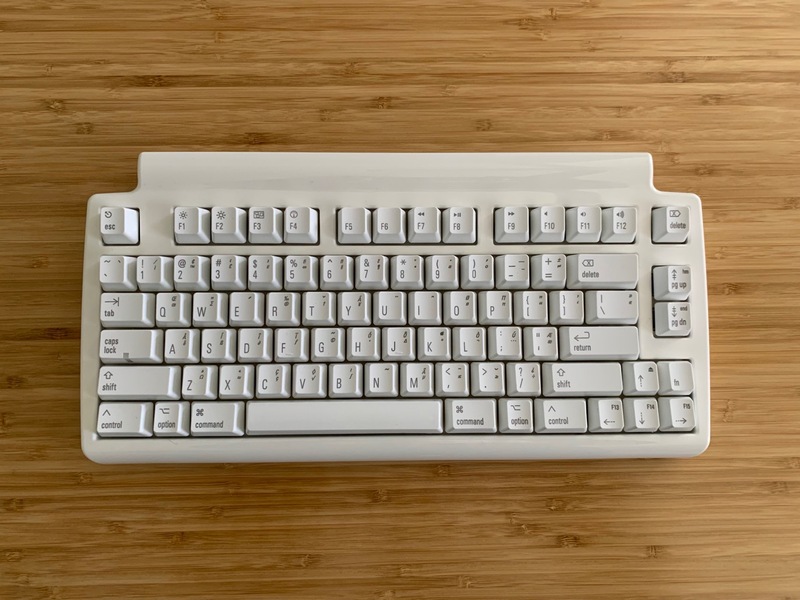 I bookmarked a couple of Kickstarter projects over the years for lower profile mechanical keyboards. I even reached out to one which is now available asking about their return policy and did not hear anything. I am going to stick with the Das Keyboard. As I wrote this today, I will miss the backlighting, but I find the 1/4 inch in height makes a noticeable difference and I can not get past the how WASD is handling the V3 rollout and update requirements. See Update Above - I eneded up going with a WASD Code MX Brown.